In other words, the bomb that caused what you see in this photo was a small one. Primitive. Simple. By modern standards what you see here is puny. But it rendered the area uninhabitable for seven decades and tossed around some of the largest objects humans know how to make. As Ed notes, it's been almost 30 years since we had superpowers locked in a Cold War. Many of us have forgotten, or never knew in the first place, what it was like to live under the shadow of a nuclear war; one which would destroy human civilization as we knew it, and perhaps the human species itself. At the height of the Cold War, this was no exaggeration. Nuclear weapons deployment peaked in the mid-1980s. 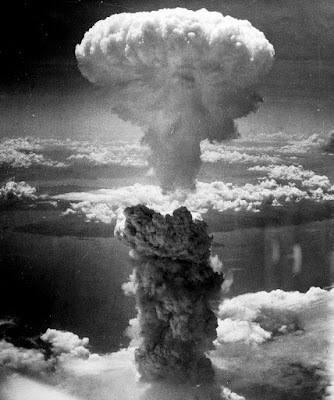 The USA and USSR between them had some sixty-five thousand nuclear warheads, all of them orders of magnitude more powerful than the bombs which devastated Hiroshima and Nagasaki. Strategists in quiet rooms drew up cold, logical, and utterly insane plans of how to target them for maximum effect. The Cold War arsenals were more than enough to destroy every significant settlement on the planet. At best, our species would have been reduced to a handful of desperate survivors, perhaps in areas too poor or remote to bother targeting. Side effects of fallout and nuclear winter might have left not one single human being alive. Since then, US and Russian arsenals have been progressively reduced to no more than 1550 each. (It's been reported Trump believes this to be a bad thing, which by itself indicates he is dangerously ignorant of nuclear policy.) The reduction is an improvement, but let's bring it into perspective. Suppose the 3000 largest cities in the world were targeted by a US or Russian nuclear weapon. Targets would include Slough, England and Syracuse, USA, each with a population of about 142,000. These arsenals are less than a tenth of what they were, but still terrifying in their scope. If Trump launches everything in a late-night fit of rage, then our species will probably survive in some form; but it's all over for civilization as we know it. Moreover, Defense Secretary James Schlesinger recalled years later that in the final days of the Nixon presidency he had issued an unprecedented set of orders: If the president gave any nuclear launch order, military commanders should check with either him or Secretary of State Henry Kissinger before executing them. Schlesinger feared that the president, who seemed depressed and was drinking heavily, might order Armageddon. Has something like this been done to Trump? Are nuclear orders from Trump to be routed through someone like Defense Secretary James Mattis? We probably won't know for decades, if at all. The Twenty-Fifth Amendment gives Trump's Cabinet a formal, legal channel with which to remove him from power, but they choose not to exercise this ability. On balance, I hope Trump's nuclear button has been disconnected. I don't want to be blown up. Either way, the situation is deeply worrying. At best, the US government is so badly broken that, in secret and without any legal authority, officials have seized control of nuclear weapons for themselves -- and they intend this situation to continue for years, not just days. They may have the best of intentions, but it's still a terrifying prospect. At worst, Trump himself is in full control of US nuclear weapons, which is an even more terrifying prospect. It gets worse, because Trump isn't the only spoiled princeling in command of nuclear weapons. He and North Korean leader Kim Jong-un have taken to trading threats and insults on Twitter. What if this gets out of hand? What if the North Koreans misinterpret a Trump tweet? They might suspect a US attack is imminent, believe they have nothing to lose, and launch their nuclear weapons. North Korea is estimated to have at least 10 warheads and missiles for their delivery. This isn't comparable to the arsenals of the Cold War; but it's enough for genocide on a scale seldom seen in human history. Combined with North Korean conventional weapons targeting the South Korean capital of Seoul, there would be millions dead; in South Korea, Japan, perhaps on the west coast of the United States if North Korean missiles can reach that far. Millions dead. That's more than all the people slaughtered in the trenches of the First World War, but in the space of a few minutes instead of four years. Horrifying though it is, that is not the worst plausible outcome. It supposes absolute restraint by the other nuclear powers. What if the USA launches a nuclear retaliation against North Korea? Trump would do it without hesistation, and as things stand the order would be entirely lawful. Even a professional like Mattis might approve the order, if millions of his countrymen had just been slaughtered. What if China or Russia interpret the incoming missiles as an attack on their own territory, and respond in kind? Maybe Corker is aware of some secret arrangement to keep Trump out of the nuclear chain of command; he might be in a position to know. Even then, in the most generous interpretation of his actions, he is taking unacceptable risks with our safety --- not to mention the rule of law in the United States. At most, the senators content themselves with token gestures of opposition. They could do more, much more, to remove Trump from office. If Trump was impeached or removed by the 25th Amendement, he would be replaced by Vice President Pence. In policy terms, Pence is more than acceptable to conservative Republicans; and crucially, he is far less likely to destroy the world. In the face of global annihilation, those like Senator Corker believe making empty speeches is sufficient action. Their behaviour sickens me. We can only hope to survive it.